Mamma Nonna’s Taralli is a very simple, unleavened & lightly sweetened snack. This family recipe for taralli must first be boiled & then baked in order to achieve that perfect crunch. 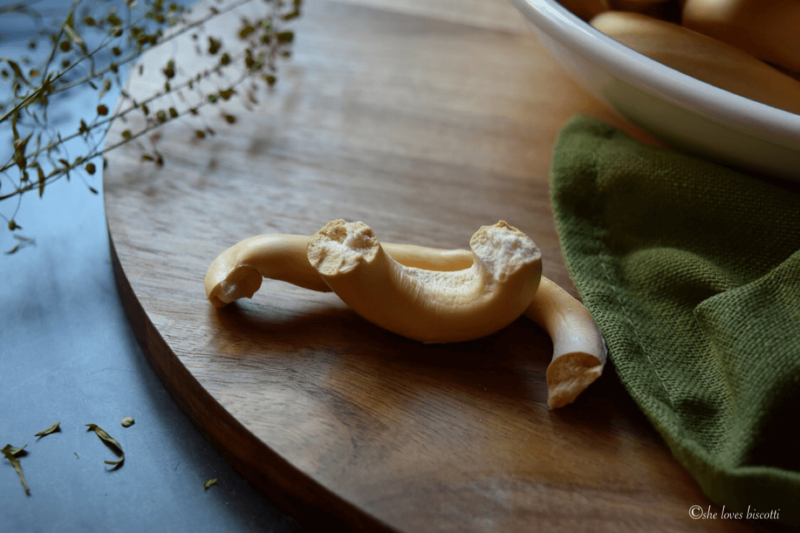 This Mamma Nonna’s Taralli post was originally published on October 14, 2014. Updated on November 2, 2017. Isn’t it funny how we name certain recipes after the person who makes it? Originating from Benevento, in the Campania region of Italy, my grandmother immigrated to Montreal, like thousands of others, to improve her family’s living conditions. Like most Italian grandmothers, cooking and baking came naturally. Recipes were handed down from generation to generation by cooking and baking together. Measurements were described as handfuls and “as much flour as necessary”. It was challenging to get precise amounts. Some time after Mamma Nonna passed, I remember a conversation I had with my mom, about tradition and how important it was to keep it alive. It was during that conversation that I asked my mom about Mamma Nonna’s Taralli recipe. We made plans to document as many recipes as possible starting with that one. Unfortunately, there was a bigger plan for my mom and we never got a chance to complete this special project of ours. However, we did manage to document a few of my favourite recipes and Mamma Nonna’s Taralli recipe was amongst them. 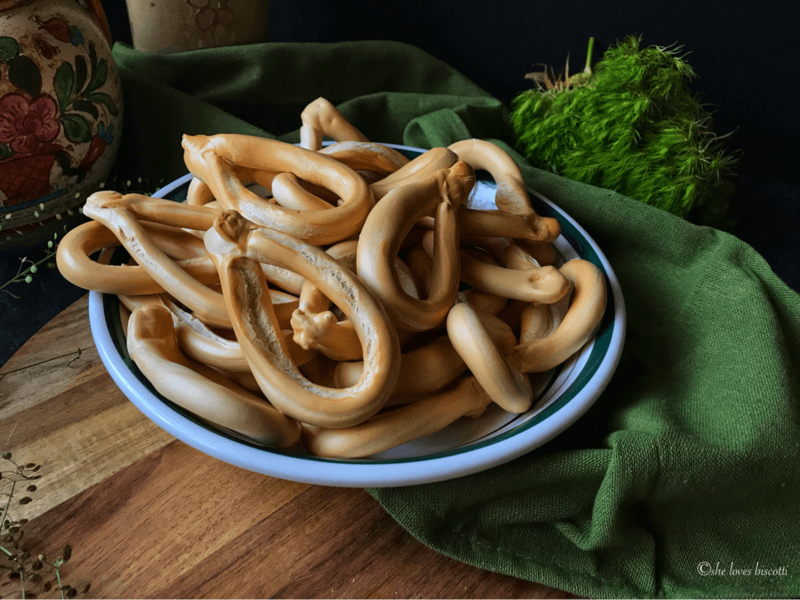 If you are of Italian decent, or if you had one friend who had an Italian grandmother, chances are you know what a taralli is. 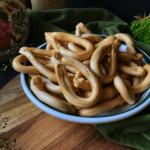 If you are not sure, just click on this link for Homemade Italian Fennel Taralli da Tavola di Filomena where I provide you with a description of taralli. I have a total of seven taralli recipes and I am presently working on a beer taralli… stay tuned for that one! As was mentioned, Mamma Nonna’s Taralli is a very simple, unleavened, and sweetened treat which is boiled before it is baked. But before we can bake these taralli, we need to make them. Mamma Nonna’s taralli recipe can be combined in the food processor or whisked together in a bowl. 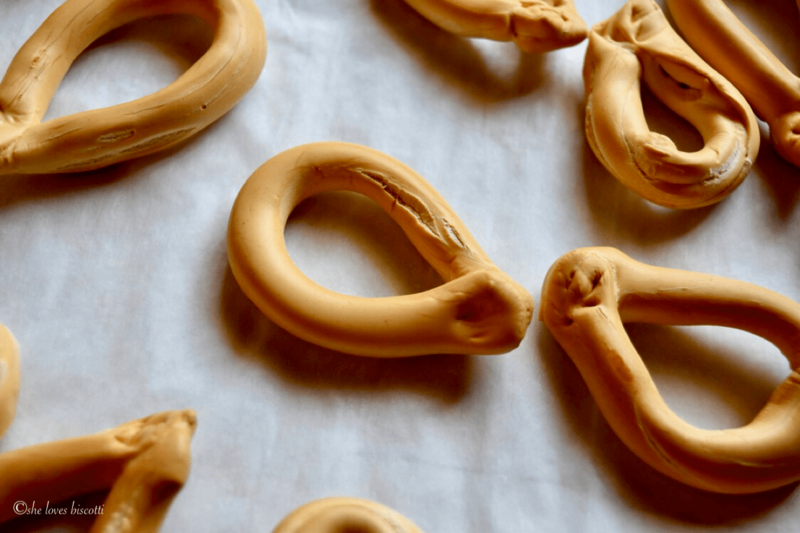 I have scaled down this recipe so that it can easily be make in a couple of hours since kneading, boiling and shaping the taralli does take a little bit of time. In my humble opinion, these taralli are totally worth it! Please note that the recipe can easily be doubled. So once the ingredients have been combined, place the dough on a wooden board. The dough is a little on the crumbly side, but do your best to knead it into a ball. Wrap the dough in cellophane and just forget about it for a couple of hours. This rest time will allow the gluten to relax. Divide your ball a dough in thirds. Make sure to keep the rest of dough covered as this dough will dry out very quickly. I will use my pasta maker attachment (set on number one and on low speed) to flatten the dough. This is done by folding and re-folding the dough and passing it through the rollers. Repeat this procedure a few times until the dough is very smooth and shiny. Alternately, you can use a rolling pin. Place the flat piece of dough on the cutting board and cut into thin long strips. I prefer to make my taralli mini so I cut each third in 10 slices. Roll each piece of dough in the shape of a log and connect the two ends, forming the shape of taralli. Continue this process until all the dough has been shaped. Once you have shaped the taralli, it is time to boil them. Drop the taralli in a pot of simmering water. When taralli rise to the top, remove them with slotted spoon. This will take less than one minute. Set the boiled taralli on a cookie rack to drain properly. Repeat this process with the other two thirds of dough. It’s finally time to bake the taralli! Simply place on a parchment lined baking sheet and in the oven they go. You will notice that the taralli will develop cracks during the baking process. You will also notice that there is very little moisture in this dough and the final product, when done correctly, will be very light, airy and crunchy. One final note about this recipe that I would like to document (as this is a family recipe) is that my grandmother would use about a teaspoon of brioschi in this recipe. For those of you that don’t know, Brioschi is an antacid. I have always found this interesting! You will see that in the recipe, I have substituted with baking powder. Mamma Nonna’s Taralli are simple to make, once you get the hang of it. Hope you get a chance to try. Do you have a favorite taralli recipe? Would love to hear about it! 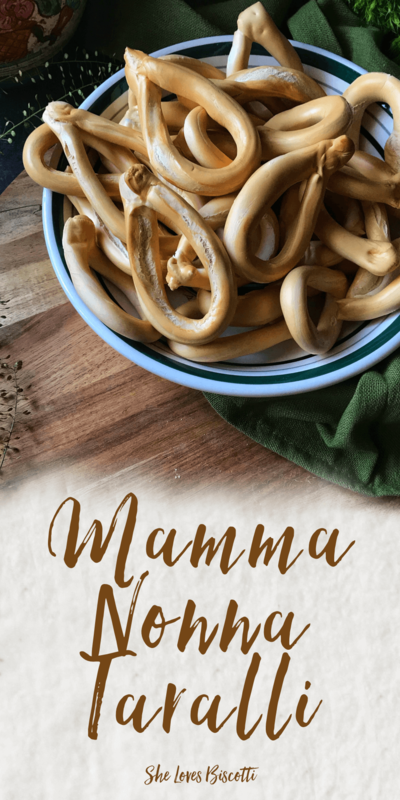 Mamma Nonna's Taralli is a family recipe for a very simple, unleavened & lightly sweetened snack that has a wonderful crunch. Continue beating while adding sugar, oil and milk. In the bowl of a food processor or in a mixing bowl, sift the flour, baking powder and salt together. Mix on medium speed until combined. Alternately, you can knead by hand. 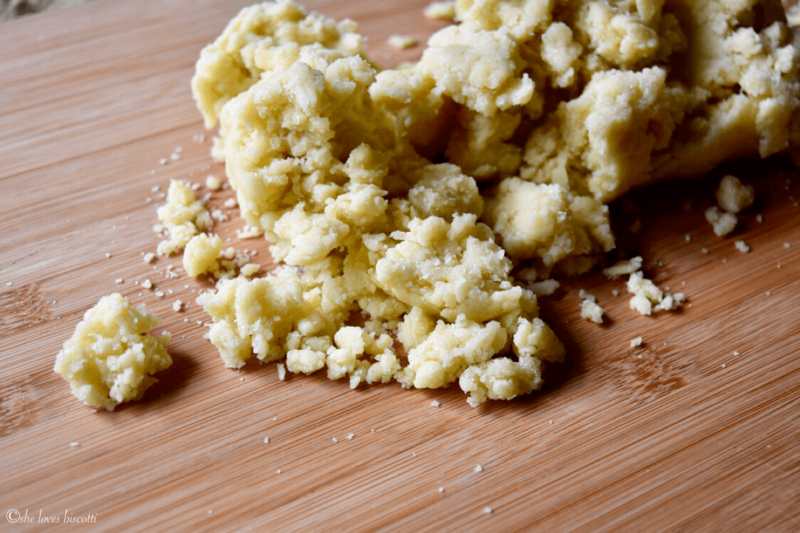 Transfer dough to wooden board and knead gently into a ball. 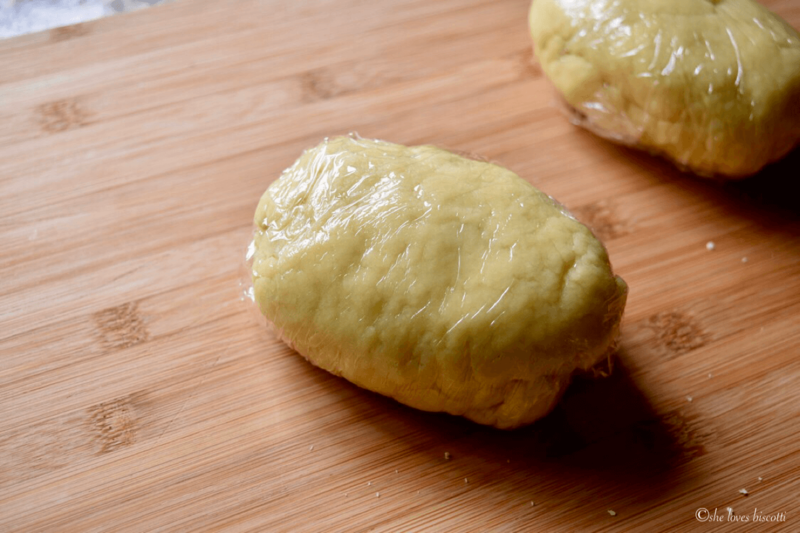 Wrap the dough in cellophane and allow to rest for 2 hours at room temperature. Prepare a pot with boiling water. Divide dough in thirds (keep rest of dough covered while working the thirds). Flatten the dough with pasta maker attachment (set on number one and on low speed). This is done by folding and re-folding the dough and passing it through the rollers. Repeat this procedure until the dough is very smooth and shiny (2-3 minutes). Alternately, you can use a rolling pin. Place flat piece of dough on cutting board and cut into thin long strips. I prefer to make my taralli mini so I cut each third in 10 slices. Roll each piece of dough and connect the two ends, forming the shape of taralli. Continue until all dough has been formed. Drop taralli into simmering water. When taralli float to the top, remove with slotted spoon. This will take less than one minute. Set the boiled taralli on a cookie rack to drain properly. Repeat this process with the other two thirds of dough. Place boiled and drained taralli on parchment lined baking sheet. Bake at 350° F for approximately 25-30 minutes or until golden brown. I use my food processor and pasta maker attachment of my KitchenAid to complete the kneading process. LOVE THIS RECIPE? PIN IT TO YOUR TARALLI BOARD! Maria your Taralli turned out beautifully! They make a perfect snake for game night! It’s funny but I too recall my mom using brioschi in some of her baked goods and I’ve always been curious by it but have never tried it myself! Love this recipe, as they make a yummy afternoon snack! These look just like my mom’s except we called them chumells. I have been looking for this recipe. Thanks! I am going to try to make these for my kids, they love taralli! Maybe Val will come help! So here is the update: they were very tasty, and not as difficult as I thought to make! We did forget to roll before we boiled them, so they did not look as nice as yours. I will double the recipe, and try round number two next weekend. Well worth the work.